A twitchy eye is generally considered a non-serious eye condition and is commonly experienced by patients. Medically, an eyelid twitch is referred to as ‘Myokymia’. The twitching sensation is the result of the sudden spasmodic contraction of the obicularious muscle, which is normally used for closing your eyelids. The twitching sensation most often effects the lower eyelid and occasionally can even place pressure on the eyeball itself causing the eye to twitch. Some patients are convinced that their eye is actually twitching, however, this is a vary rare phenomenon. Symptoms from myokymia can last up to a month and can disappear as quickly as they began. Although most eyelid twitches are not medically significant, it is always best to visit your optometrist or eye doctor to rule out any other more serious eye related diseases. Treatment for myokymia usually involves rest and relaxation, drinking plenty of water, and eating foods high in potassium. Fun Fact: Did you know that seeing your optometrist for a condition like myokymia is now covered under Alberta Health Care. Like us on Facebook and pick up a free pair of UV 400 sunglasses for your kids in-store at eye-bar optometrist, opticians & eyewear specialists. At eye-bar, we believe in eye health. With approximately 80% of all ocular UV damage occurring before the age of 18, it’s important to protect your kids eyes. As summer approaches and children spend more time outdoors playing, wearing appropriate eye protection such as hats and sunglasses is increasingly important. We offer numerous different styles and sizes of free sunglasses for your children to choose from, as a proper fit is half the battle. 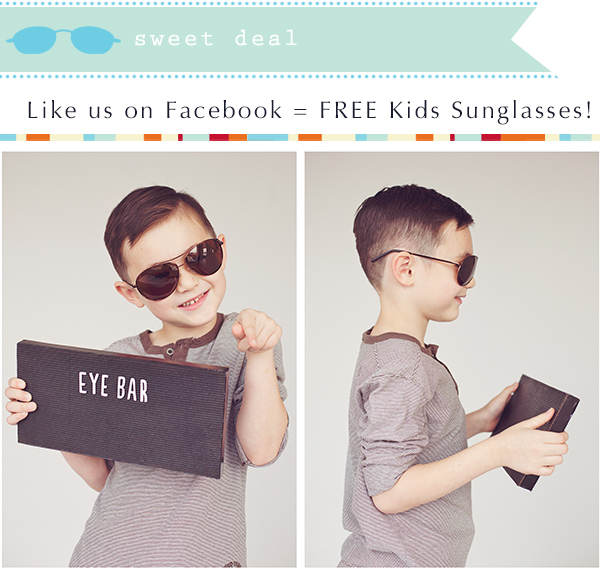 The free sunglass collection tends to fit most children ages 3-10 comfortably. FYI: Don’t forget to also book your children in for their annual eye health examinations. Annual eye health examinations are paid for by Alberta Health Care, and are an important part of your child’s overall health. Book your child’s next eye exam appointments with Dr. Ross McKenzie online today! *Offer valid, while supplies last.